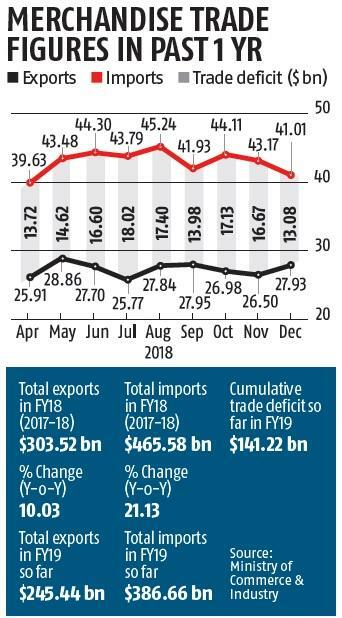 The trade deficit in December last year fell to its lowest in the current fiscal year (2018-19 or FY19) as imports contracted for the first time. The effective trade deficit shrunk to $13.08 billion, lowest in FY19. It was $16.67 billion in November. On the other hand, a high base effect and falling outbound trade of big exchange earners — such as gems and jewellery, engineering goods, and pharmaceuticals — nearly wiped out export growth in December, which fell to 0.3 per cent. This was lower than the already bottom-trawling growth rate of 0.8 per cent in November last year. Outbound trade rose by the smallest margin so far in the current fiscal year to $27.93 billion. Exports contracted just once this year, in September. Despite the government suggesting this was because of global headwinds, it had worried policymakers since the fall had come even as the rupee depreciated against the dollar. In December, imports fell to a three-month low as gold, the second-largest component of the import bill, saw a sharp drop in inbound shipments. Imports of the metal fell by 24 per cent in December to $2.56 billion. The rate of fall was faster than the 4.31 per cent contraction in November. The gold industry continues to see volatility as imports had risen in July after remaining in negative territory for six consecutive months. Imports of the metal had remained low since the Rs 143-billion Nirav Modi scam earlier this year. Experts said this may have been a consequence of the considerable restocking that took place over the previous quarter, and may also have been led by the late start to the festive season. However, the largest component of the import bill, crude oil, saw a slower rise in December, in line with expectations. Crude imports rose 3 per cent, much lower than the high 52 per cent rise in September. Global crude prices started reducing from early November and a supply glut is expected to stay as sanctions continue to pump out oil, while the US adds fracking capacity. Non-oil non-gold merchandise imports, showcasing industrial demand, also fell in December, albeit at a slower pace. It contracted by nearly 2 per cent, down from 5 per cent in November, to $27.76 billion. Seventeen out of 30 major product groups were in the negative territory in December. Receipts from processed petroleum exports continued to swell, albeit at a slower pace. It rose 13 per cent to $4.2 billion in December, down from the 42 per cent rise in November. A spin-off effect due to a global trade war between the US and China had also affected the country’s trade, impacting both imports and exports. 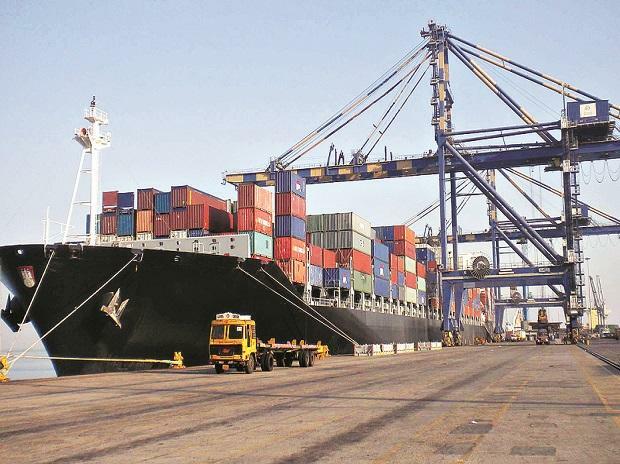 We reiterated his demand for urgent and immediate support including augmenting the flow of credit and better fiscal support," Ganesh Kumar Gupta, president, Federation of Indian Export Organisations, said. Another major export earning sector — gems and jewellery — continued to contract, after lapsing into the negative zone in November. Shipments shrank by 19 per cent, more than the 17 per cent fall in the previous month. The sector had returned to the growth charts in June after months of contraction. The export of engineering goods and pharmaceuticals also contracted. “The unfolding global situation comprises not only problems on account of trade tensions between China and the US but other issues like uncertainty over Brexit fall out in the European markets. The situation certainly calls for a major rethink and redrawing of our export strategy, amongst exporters, government and the RBI as to how to plug the loose ends and reduce the cost of shipments along with easing of procedures,” Engineering Export Promotion Council Chairman Ravi Sehgal said.